I was recently asked this question by the rehoming centre team. Being the Education and Community Officer for Shropshire means I can also work closely with the Shrewsbury Rehoming Centre. And even though I love being out and about visiting schools, it’s a fantastic bonus being based at a rehoming centre. Every day I am reminded of the amazing work that the staff do in the centre with our lovely dogs. I also get the opportunity for a quick playtime and some lovely strokes with the dogs in our care. So, imagine my excitement when the manager asked me if I would deliver a presentation about the work that we do in education for the rehoming centre staff. Every day the staff see me whizzing in and out of the centre off to schools and wanted to know more about the education programme, what we do in schools and the different projects that we run. The staff were amazed to hear how busy we are each week in schools and that we cover the whole of the UK. They loved learning all about the different workshops that we offer and how they incorporate the importance of ‘responsible dog ownership’ and ‘staying safe around dogs’. The staff were also surprised to hear that our workshops enhance a variety of curriculum subjects such as; maths, english, science and history. 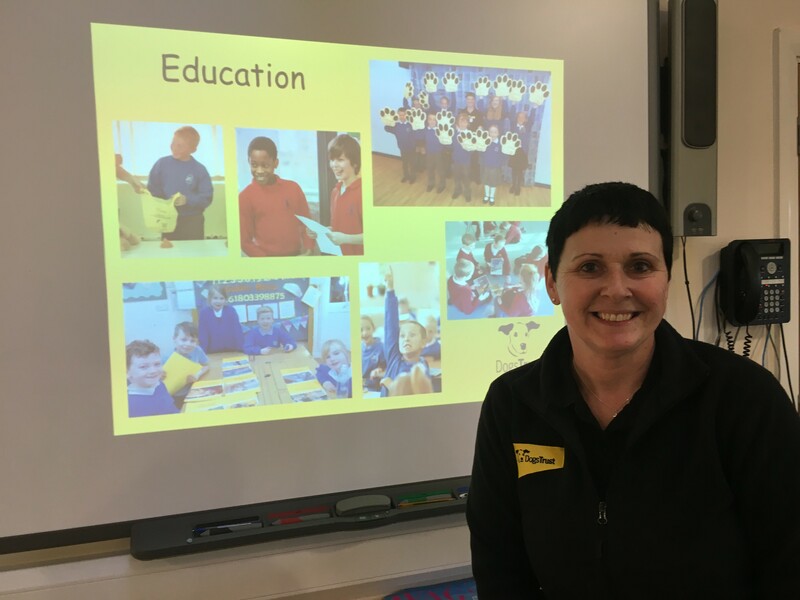 It was a fantastic opportunity to showcase the work that we do in education and highlight how the education team are working towards the Dogs Trust mission; ‘when all dogs can enjoy a happy life free from the threat of unnecessary destruction’.